Sweet, salty, and spicy, these are great along with a main entree or on their own for a snack. 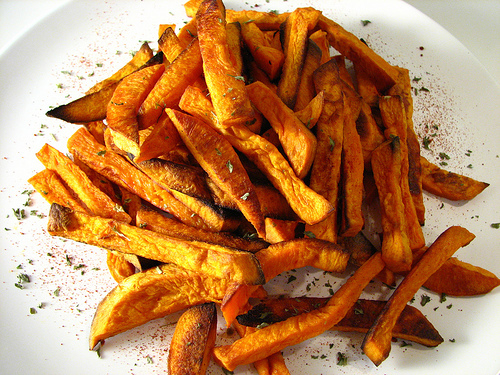 Cut the sweet potatoes in half by width and then in half again lengthwise. Cut these chunks into thick or thin wedges, about 1/2 inch thick.They should be uniform to each other for even baking. In a mixing bowl, cover the wedges with the melted fat and add the spices. Toss and mix very well until potatoes are evenly coated. Transfer potatoes to a baking dish and bake for 30 minutes–but after 15 minutes take them out to stir and toss, adding more oil or spices if desired. Cook for more or less than 30 minutes if necessary depending on size of fries. Slice off the root ends of the parsnips and cut them into wedges. They will be thinner at one end and thicker at the other. Try to make them about the same size for even cooking. In a small saucepan, heat the coconut oil gently until it turns liquid, but not too hot to handle. In a large bowl, mix together the parsnip fries, the oil, and all other ingredients. Toss well. Place on a baking dish. Size 9 by 11 inch works well. Roast the fries for 45 minutes. Toss them about 2 times or so during the cooking.